Yep, that's right. 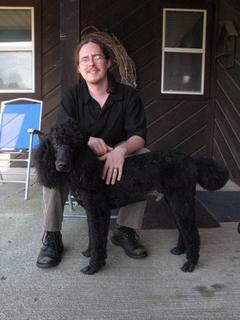 Daughter Jocelyn and hubby Tom are the proud parents of a 6-year old black standard poodle! Wow. He is so handsome. No details on weight or height, but he is a fine dog. They came from Charlottesville, VA, to Indianapolis to adopt him. He is a very special dog and is really lucky to have been adopted by them. He follows them very closely, not letting them out of his sight. We spent today cleaning out the barn. Took a lot of stuff down to the sale barn. There will be a sale in a couple weeks and hopefully it will all find a new home. We aren't taking any of it back anyway. We recently purchased a new Toad! We probably won't take it with us anywhere this year, as it is a little heavier than we like to pull behind the motorhome. Once we upgrade to the "diesel" motorhome, we will be able to pull it easily. I am going to try and include a picture, if I can figure it out. Oh, BTW, school started today and GUESS WHO DIDN'T HAVE TO GO??????? I love this being retired stuff. Wow, what a month. We have been working on the house almost non-stop while we are here in central Indiana. We have it emptied of everything except that which we are using every day. We have it all painted on the inside. We have it measured for new carpet. We went shopping for new carpet, but the store had few selections. They are getting new shipments in and ready to look at on Tuesday, so we will be picking out carpet and setting a date for installation. We intend to be out of the house when it is installed. That just leaves the barn. Our little town fair is over today, so the auctioneer who is working with us to get rid of some of Terry's tools will be able to get into the building at the fairgrounds and set up for an auction. So that will help to empty out the barn. We have a place to store the boat, jetski and trailer, so we will really be getting closer to our goal. We hope to contact the realtor next week about listing the house for sale. What a job this has been. Mom and Dad were down this past week and helped immensely. Dad did a lot of taping for painting. He didn't seem to mind doing that and Terry hates it. Daddy really does a good job, so it was a big help to Terry. Mom helped me pack the kitchen cupboards up and go through a bunch more cabinets in the laundry room. Plus she cleaned up rooms as we got painting done. She and Daddy helped me take down two large shrubs which had grown too large for where they were. That part of the yard off the deck really looks better. 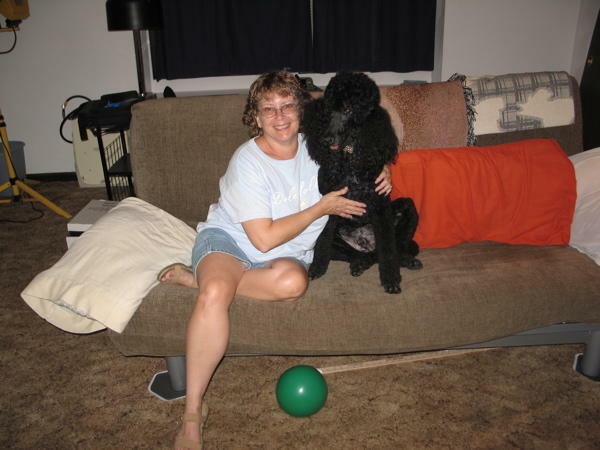 Mom and Dad also dog-sat for Bailey and Neal. They are lucky to have such great grandparents to take care of them! In between times, Terry and I made a trip to Goshen with another trailer load and when we got back we all went to the fair and walked around one night. That was the only night we did that and today we watched the parade. That is the last time we will be around for that fair. We are moving on to a new chapter in our lives. 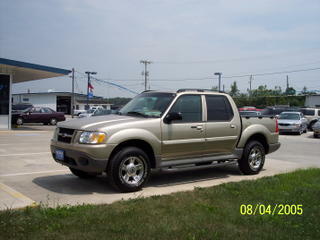 Today we drove to Ohio to get our new (to us) truck. It is our future "toad." For you non-RV'ers, that is the vehicle we intend to "tow" behind our motorhome. It is a 2003 Ford Explorer Sport-Trac. It is pretty sharp and we have spent the evening putting a heavy duty hitch under it. That was quite a job. The worst part was lining up the holes to bolt it down. It was heavy, but we used a floor jack to raise it up under and that worked quite well. So there really was no lifting or heavy work, just tedious lining up, etc. We are running up to Goshen again tomorrow. We have several appointments this next week and I have already moved some paperwork I need up to the house in Goshen. We have to go up in order to get that paperwork. Stupid me. We also need to check on the apartments. That is the other thing taking up time. We have a new renter in one apartment. Yay! We have another vacant apartment which we are renovating and is almost done. We hire most of that work out now because Terry is not able to do a lot of it anymore. Monday will be a milestone for me. It is the first day of school at New Castle, where I taught in a former life. (May 31). No longer will the ring of school bells require my getting up and going to work! I am glad to leave my working life behind, although, from the sounds of this post, I am working MORE! But that will be over shortly and Terry and I will be off on a great adventure with our Scotties, Bailey and Neal.